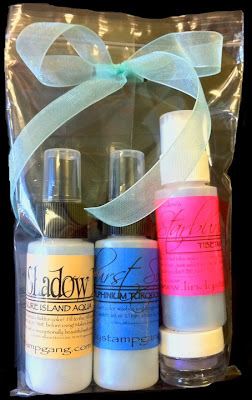 I really enjoy using the products from Lindy's Stamp Gang and for this specific project I used lots of different ones. The paper is from the Webster's Pages Garden Gala Collection and I sprayed it with Gator Gumbo Olive Starbust Spray to give the shimmer over the entire page. For the flowers I used the California Golden Poppy Starburst Spray as well as the Burnished Brass Moon Shadow Mist. 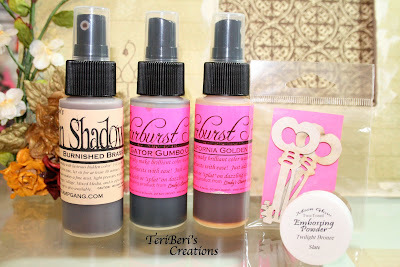 The Filagree key is also from Lindy's Stamp Gang and I used the Twilight Bronze Slate embossing powder to emboss the entire key. I really LOVE the way all these products work so well together. I also wanted everyone to know that now you can join Lindy's Stamp Gang on Facebook HERE. Teri, you've inspired me! I actually went and bought one of these frames over the weekend. I plan to do one of them soon and see how it goes. Then we'll see if I need more LOL Love your misting and of course your flowers! As always you have outdone yourself. All of your frames are beautiful. Love them all. If you keep it up you might just have to open an etsy store. LOL. Why not? People would buy them in a heartbeat. Love your flowers and how you changed the key. What you do with the back of the frames? I love the 3D effect of the flowers Teri! Beautiful and so creative! Keep them coming! Gloria - I just painted the back of the frame with a mushroom color acrylic paint. That is what I have done to all the frames to give it a finished look. These are so much fun to make....this is my 3rd one and I have a few more to make. Gorgeous Teri! I love your flowers. The colors are beautiful. TFS! Gorgeous work, Teri! You've really inspired me to make my own frames for Christmas presents! I can't wait to see more of your frames! Hugs!!! BEAUTIFUL, BEAUTIFUL!!! Right away when I saw the layout, I instantly knew the paper was "Webster's Pages"; I knew just by looking at the way you embellished the page. LOVE the flowers. =) Have a fantastic day.